Tucked away in the heart of Gramercy Park, a brightly designed yogurt shop sits on the corner of 20th St and 3rd Ave. While the neighborhood is relatively quiet, one step inside Orange Leaf and one is met with an array of exuberant color and energetic, lively music, immediately creating a fun, spirited atmosphere to enjoy a sweet cup of yogurt. When I walked into Orange Leaf on a warm Friday afternoon, I was met with a swirl of orange and pink tiles. Michael Jackson was playing in the background and a giant, flat-screen television was behind the counter showing pictures of happy customers and all of the different flavors Orange Leaf has to offer. Even better, I was greeted with smiles: all of the staff seemed genuinely happy. Cutting up fresh strawberries and offering tastes of various flavors of yogurt was done with enthusiasm. I’ve been to my fair share of frozen yogurt shops and have seen my fair share of emotionless faces who clearly hate their job; this was not the case with Orange Leaf. The many windows let in a ton of natural sunlight and brightened everything up a bit. I was comfortable, happy, and excited to try the product. Like many frozen yogurt shops, there were sixteen different flavors to choose from. I chose to get a wide variety, in order to look at the shop through a thorough lens. A friend joined me on my froyo excursion, so between the two of us we were able to get six different flavors. 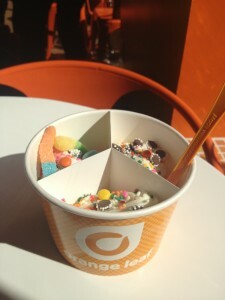 One of the best aspects of Orange Leaf is the optional cup divider. I had never seen cup dividers before, but they are amazing! If you’re a frequent froyo consumer, you know the difficulty in choosing what flavors will blend together the best. You can’t get Coconut and Peanut Butter or Mango and Coffee without the yogurts blending together to make a multi-colored mess that tastes like a bunch of foods that were thrown into a blender. With the dividers, one has three separated sections, with no unnecessary combining of flavors. Just pop one in and you’re all set! Altogether we tried Watermelon, Pomegranate, Chocolate Raspberry, Peanut Butter, Wedding Cake, and of course the classic Tart. All of the flavors tasted great and were incredibly accurate to their name! Topped with both regular and sour gummy worms, peanut butter cups, chocolate chips, and fruit, I was very satisfied and was given a really great first impression. 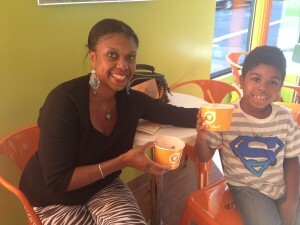 Compared to other froyo places I’ve visited, Orange Leaf is intimate yet energetic and definitely a nice change in scenery from the 16 Handles or Pinkberry franchises I seem to see on every street corner. Whether it’s their Ounce Card, giving you a money-back point for every yogurt purchased, or the Ipad sitting in the store allowing customers to register for a rewards card or to begin following Orange Leaf on Twitter or Facebook, this yogurt shop seems to stand out. Convenience and quality are definitely priorities. 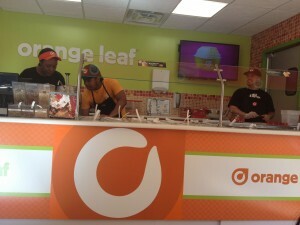 My first visit will definitely not be my last; I would highly recommend a visit to Orange Leaf. Wedding Cake flavored froyo—need I say more? This entry was posted on Friday, September 13th, 2013 at 4:32 pm and is filed under Cheap Eats, onFood, Restaurant Reviews. You can follow any responses to this entry through the RSS 2.0 feed. You can leave a response, or trackback from your own site.